From left, Australian Defense Minister Marise Payne, Foreign Minister Julie Bishop, South Korean Foreign Minister Kang Kyung-wha, and Defense Minister Song Young-moo attend a press conference at the Foreign Ministry in Seoul, South Korea (Oct. 13, 2017). Closer security cooperation between Canberra and Seoul appears certain at a time of heightened regional tension. In a doorstop press conference in Seoul in early September, Australian Defense Minister Marise Payne was asked about the prospects for upscaling security cooperation with South Korea. 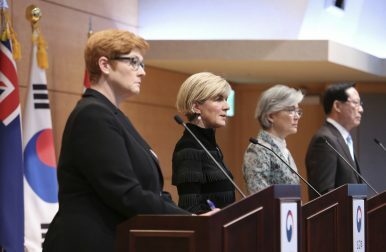 In response, Payne contended that the challenging situation on the Korean Peninsula demanded the further development of collaborative and interoperable strategic relationships between likeminded regional actors, indicating that greater defense cooperation between Canberra and Seoul was highly likely. A month later, Payne returned to Seoul in the company of Australian Foreign Minister Julie Bishop for the biannual 2+2 Meeting with their South Korean counterparts, Ministers Song Young-Moo and Kang Kyung-Wha. The resultant Joint Statement confirmed a further strengthening of the Australia-South Korea security relationship, one that has gathered increasing momentum ever since its formalization in 2009. Indeed, 2017 has seen a notable spike in Australian engagement with South and inter-Korean affairs. Government and opposition politicians alike have visited Seoul in a show of solidarity, while in August Pyongyang issued Canberra with a warning against subscribing to U.S. President Donald Trump’s inflammatory rhetoric, a threat repeated earlier this month. Given Australia’s increased engagement with the Korean Peninsula and uncertainties regarding the intentions of both Trump and the North Korean regime, the time is ripe for Australia and South Korea to seize the initiative and strengthen one of Northeast Asia’s blossoming minilateral strategic relationships. While the recent 2+2 Meeting sent a strong signal, the extension of an invitation for South Korean ground forces to conduct joint exercises with Australian and U.S. troops in the North Territory would seem to be a logical next step. Indeed, given Australia’s status as one of South Korea’s only two 2+2 relationships, Canberra possesses a “discreet vantage point” from which to encourage a fellow U.S. ally and likeminded middle power to integrate further into the regional strategic framework. Developments in recent years have demonstrated the intent of both states to assume greater regional security activism through strengthening their own relationship. Following the Joint Statement on Enhanced Global and Security Cooperation Relations of 2009, which prioritized interoperability, frequent joint exercises, and regular security dialogue, bilateral talks between the two countries’ defense ministers subsequently commenced in April 2011. The inaugural 2+2 Meeting between foreign and defense ministers was held in Seoul in 2013, while the follow-up meeting of 2015 produced a comprehensive Defense and Security Cooperation Blueprint, expanding the scope of cooperation to encompass freedom of navigation and overflight exercises in the context of tensions over the South China Sea. The most recent 2+2 Meeting, therefore, only confirms the positive trajectory of security ties between Canberra and Seoul, reflecting Seoul’s determination to demonstrate its capacity for strategic thought beyond the traditional North Korean flashpoint. Strengthening defense ties with Seoul also allows Canberra to send a broad message to the region that Pyongyang’s efforts to decouple regional alliances will only have an inverse effect. The growing Australian-South Korean strategic relationship is fundamentally underpinned by their common alignment with the United States and its regional security network. Indeed, Payne had in September highlighted the impending purchase of F-35s from the United States as a strategic commonality upon which closer defense cooperation with Seoul could be built. Furthermore, Australia’s future class of frigates are slated to be outfitted with Lockheed Martin’s Aegis combat management system, a development more notable for its interoperability with other regional security partners — including South Korea — than for its provision of a comprehensive missile shield. Building upon the momentum of joint air force and naval exercises, further bolstering security cooperation through joint ground force exercises in the Northern Territory would seem to be the logical next step. In fact, South Korea is Australia’s only Northeast Asian security partner yet to participate in such training exercises: Chinese and Japanese troops have participated in joint exercises with ADF and U.S. personnel on separate occasions. Given that war on the Peninsula is “the most plausible scenario under which the ADF [Australian Defense Force] could again be involved in a land conflict in East Asia,” focused collaboration between Australian and South Korean ground forces would complement recent improvements in air and naval interoperability. In improving their own strategic relationship, both Australia and South Korea will need to balance between the demands of other regional economic and security partners. In any case, it is clear that Canberra and Seoul regard their strategic relationship with increasing importance. While joint ground force exercises stand out as a logical next step, it will be interesting to see the exact manner in which the “highly likely” development of security cooperation manifests. Tom Corben is an International Relations and Asian Studies (Hons) graduate from the University of New South Wales, Australia. Canberra’s reactive approach to the Korean Peninsula is antithetical to its interests and middle power aspirations.